This is what a broken immigration system looks like. Nobody's going to wait 6 years, much less 20. If we want to fix illegal immigration, we need to make legal immigration quicker and less expensive. I, along with most people in the United States, am a descendant of immigrants. I don’t know all of the details, but I can say that one side of my grandfather’s lineage (on my mother’s side of the family) immigrated to the United States from the UK in the late 1840s and settled on the east coast. My mother’s from Virginia, my father’s from Iowa, and they met here in California, where I’ve lived my entire life. Almost everyone in our country has a story like this, whether we know the details or not. And while we can all be proud of our individual heritage, we’re all Americans now. Illegal immigration is a hot-button topic nowadays, but if you look at the verifiable data, it seems that it’s really only a problem because it’s so difficult to come here legally nowadays. Former host of 20/20 on ABC, John Stossel, wrote about this 3-4 years ago. In his column, he points out that Forbes did an investigation into legal immigration and found that after a prospective immigrant goes to the American embassy and fills out their visa paperwork to be admitted to the USA, on average, a computer programmer from India has to wait 35 years to be legally admitted to our country. The same study showed that a high-school graduate from Mexico has to wait, on average, 130 years! So, when people say, “My family came here legally, why can’t they?” this is why they can’t. It’s simply not reasonable to make someone wait decades, or even over a century, to legally immigrate to another country. And as I pointed out in my section detailing my thoughts on the Drug War (LINK NEEDED), our nation’s policies are a significant part of the reason people want to leave their countries south of the border to come here in the first place. Simply saying, “Sorry, that just means you can’t come here,” does not strike me as a rational answer to this problem. Because of my job as a photographer and journalist in the motocross-racing industry, I’ve traveled all over the world, and I know many people who have gone through the process of legally immigrating to this country as well. Even for people from countries apparently favored by US immigration services, such as Australia, New Zealand, and the countries in Western Europe, our immigration system can be a total nightmare. Not only can it take a very long time, but it costs a lot of money. I’ve had this conversation with countless people, including members of my own family, and I know that my point of view may be unpopular in some circles, but I’m the kind of person who cares primarily about data. And frankly the data doesn’t seem to support the rhetoric we hear about illegal immigration. This is one that our president, Donald Trump, repeated relentlessly on the campaign trail in 2016. At this point, many people seem to just assume it’s correct because they’ve heard it so much. It’s not. 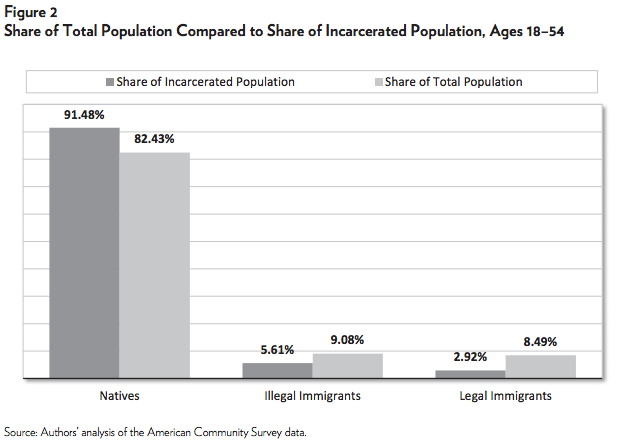 Immigrants are less likely to be incarcerated than natives are, whether they're here legally or illegally. The Cato study showed that the incarceration rate of native-born Americans is 1.53%, while the incarceration rate of illegal immigrants is 0.85%, and legal immigrants are incarcerated at a rate of 0.47%. But it doesn’t stop there, because obviously being an illegal immigrant is a crime in and of itself. When the Cato Institute controlled for people who are incarcerated only because they’re here illegally, the incarceration rate of illegal immigrants dropped to just 0.50%. That means that both legal and illegal immigrants are incarcerated at a rate of less than 1/3 the rate of native-born Americans. And if you really think about it, this makes sense. At least it does to me. If you’re in a country under a visa, or illegally, the last thing you want to do is draw attention to yourself by committing crimes. Even a conviction for a minor crime will cost a legal immigrant their visa and end with them being deported. And if you’re illegal? Forget it. Truth is, every new influx of immigrants to our country has been accused of being criminals. 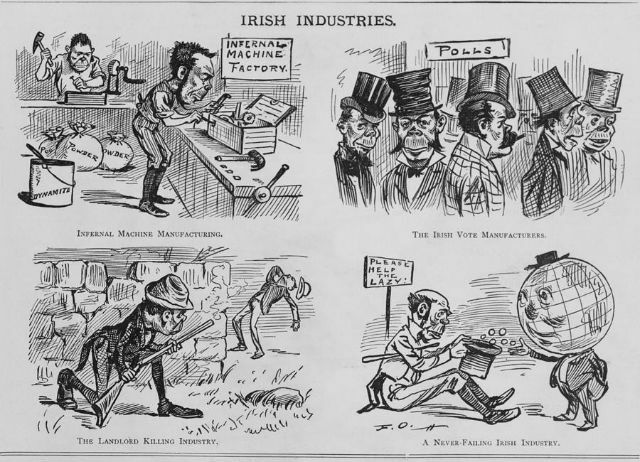 I’m of English/Scottish/Irish descent, and if you click here, you’ll see a Google search of anti-Irish-immigrant propaganda from less than 150 years ago, including this series of cartoons which depict Irish immigrants as building “infernal machines” (plotting the destruction of the USA), voting illegally to influence our elections, shooting and killing their landlords, and getting handouts they don’t deserve. It wasn’t true then, it’s not true now. This one is widely believed, and on the campaign trail in 2016, in Arizona, President Trump said the number, “could be 3 million; it could be 30 million.” The official number is about 11 million, and that number is on solid statistical ground, but what if the number is actually 30 million? Well, that would mean the incarceration rates I just cited would be much, much lower. If there were really 30 million illegal immigrants in this country, that means the incarceration rate of illegal immigrants would drop from 0.85% to 0.31%, and controlling for the crime of illegal immigration, it would drop from 0.50% to 0.18%. That would be over 8 times lower than the incarceration rate of native-born Americans. This one is pretty subjective, because it’s hard to determine what “too many” is in any objective way. Remember, almost all of us are descended from immigrants, but the real total number of immigrants is 12%. All-told, 12% of our population are immigrants. That might sound like a lot, but only 100 years ago it was 15%. Well, as I already pointed out, they said the same of my Irish ancestors, and it wasn’t true at that time, so that should make anybody skeptical of the claim as it’s repeated today. There have been many studies on this, and depending on the data they choose to include, it can seem like illegal immigrants are stealing from us, or it can seem like they’re helping us. I don’t trust any of the studies that only count the money that goes to illegal immigrants without counting the money that they pay into the system, though, and I think that’s a solid, logical position. So, if you look at it from a balance-sheet point of view, where you count the money coming in and going out, illegal immigrants are paying their own way, overall. Illegal immigrants pay taxes, too. Not as much as you or I do, but if we made them legal, they'd pay the same as we do. In fact, the same study I just referenced above shows that immigration – even as mismanaged as it is in our country – represents a net gain on the US economy as a whole. I realize there may be data sets out there that say other things, but any of these “studies” that show doomsday scenarios of billions and billions of dollars going to illegal immigrants and getting nothing in return are just not trustworthy. While I do rely on data to form my positions on things as much as I possibly can, I’m still a human being with a set of morals and principles that guide me, and I have to say that I don’t think we can have a truly “free country” if good people aren’t free to come and go with relative ease. We can have reasonable restrictions, such as making sure that we get verifiable documents from their country of origin as often as possible in order to weed out as many criminals and potential terrorists that we can, but if we’re truly going to be the “land of the free and the home of the brave” I don’t believe we can be that while locking up our borders for fear of immigrants.